In a Blog personal worst for lethargy, I am just now getting to Part 2 even though Jasco’s GE Wireless SolarCam Product Trial and Review – Part 1 was posted almost five months ago in May of this year. I got an email from one reader asking about this review, and they flagged me down at Solar Power 2007 to get the condensed verbal version. After giving the SolarCam a running start with a few clear sunny days, the unit’s 110 by 160mm (millimeter) string of solar cells charged up and maintained the integrated 6V (Volt) rechargeable battery throughout the one month trial. Over this period, about fifty so percent of the days were overcast or cloudy, and I never observed the Low Battery Indicator alert from the Receiver unit. I am comfortable saying the solar cell and rechargeable battery combination in this product is rock solid. Of course, to achieve these results, the SolarCam needs to be located in an area without solar cell shading. The integrated passive infrared sensor (PIR) responsible for motion activating camera transmissions functioned with rare false triggers at trial period temperatures ranging from about 3 to 18 degrees Celsius (38 to 64 degrees Fahrenheit). Jasco notes the PIR is sensitive to an object’s motion and the object’s heat, body heat is the typical trigger, and is less sensitive when the moving object and surroundings have similar temperatures. PIR Detection Distance and Angle are specified at 8 meters and 90 degrees for temperatures below 28 degrees Celsius (82 degrees Fahrenheit). With the trial camera pointed at a busy elevator and near a complex exit, there was plenty of people traffic moving across the PIR throughout the day peaking in the morning and evening. This steady traffic led to numerous camera motion activation events and the minimum 40 second transmission time gave the camera a steady workout reinforcing the robust performance of the solar cell and battery combination. Before jumping into the question of video quality, let’s examine the specifications of the SolarCam camera and optics. The system and video output is standard NTSC based on the 510×492 pixel array size of the camera’s CMOS imaging chip. I do not believe Jasco offers a PAL version of this product, but I need to double check on this. The camera features a fixed focus 4.3mm F2.0 lens sporting a 78 degree lens angle. Also, the camera requires the viewing area to be illuminated at night, and Jasco claims the camera’s sensitivity is 3 Lux @ F1.2. Instead of judging the video and audio capture and transmission quality by imposing my own subjective impressions, I decided to use an objective approach. Below are top and bottom paired videos taken by the SolarCam and my Canon Powershot SD800 IS digital camera during the day and at night. The SolarCam videos were digitized from the composite video and mono audio output of the Receiver unit at 320×240 resolution and 30 frames per second. Canon SD800 IS videos were shot at 320×240 pixel resolution and 30 frames per second straight to an SD Card. Uploading to YouTube added comparable degradation to both the SolarCam and Canon videos. The transmission distance between the SolarCam and the Receiver was less than 6 meters (about 20 feet). The wireless system can experience outside interference on a specific channel. To assist with outside disturbances from other 2.4 GHz products, the user can select one of four channels. The additional channels could be used to view the signal from more than one SolarCam, however Jasco has not developed an add-on camera configuration at this time. I conducted an informal Transmission Range test of the SolarCam by capturing the video as I walked away from the Receiver. In the noisy environment described above, I measured a range of about 27 meters (89 feet) before the video signal lost sync and went to static. Achieving the specified up to 50 meter (150 feet) range will require minimal transmission interference sources and line of sight between the SolarCam and the Receiver. However, many natural applications of the SolarCam are not line of sight oriented. The “9V” battery is only intended for temporary use to get the SolarCam™ System running. Remove the battery after a month. Given my trial was one month long, I did not have to mess with this, but I think many installers will prefer to shake the unit out for one month, remove the 9V battery, and then mount the SolarCam in its permanent location. The AUX port was initially designed for a future add-on device. Jasco currently does not have an add-on device in development. Last, the motion detect feature is cool and performed well, but I observe there is a few second delay from activation until the video transmission can be viewed. This is fine for sanity check, vandal, or thief security, but this represents a security hole in a professional system. In summary, the SolarCam Wireless System is great for sanity check security applications in a residential environment to observe a blind side of your home or provide an additional viewing angle on your front porch, back deck, garage, pool, shed, or driveway. The lack of wires eases installation and maintains home aesthetics while an old television gathering dust in the garage or attic would make a perfect dedicated viewing monitor. 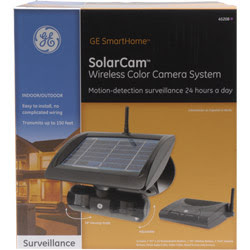 The GE Wireless SolarCam by Jasco Products Company. $249.99. It is available at www.jascoproducts.com or 1-800-654-8483. The SolarCam may not be appropriate for apartment dwellers. Although the SolarCam does not support remote panning or zoom capability, nosy neighbors fear the worst when a video surveillance camera is in plain site even when it is pointed at a common public area. I received a THREE DAY NOTICE TO PERFORM COVENANT OR QUIT from my rental community accelerating a swift end to the SolarCam trial. When the time is right, I plan to post a scathing flame of my rental community in my personal Blog, Ed Gunther’s Licht Blog.